On 28 January 2019, the Tianjin Municipal No.2 Intermediate People’s Court (the Court) gave its verdict on a prominent human rights lawyer Wang Quanzhang. Wang was found guilty of “subversion of state power” and sentenced to 4 years and 6 months in prison and 5-year deprivation of political rights. We strongly condemn the conviction and sentence on lawyer Wang Quanzhang by the Court. Before his arrest, lawyer Wang practiced law at Fengrui Law Firm in Beijing. He has a history of taking on sensitive human rights cases including the cases of Falun Gong and land rights. Since he was taken away by the police on 3 August 2015, he has been denied the access to his family and family-appointed defense lawyers. He has been detained incommunicado, during which he was reportedly tortured and suffered ill-treatment. In January 2016, Wang was accused of “subversion of state power” and his case was subsequently tried on 26 December 2018. Claiming that “due to the state secrets involved in this case”, the Court decided not to hold an open trial for the case. We maintains that the Chinese government, having imposed a pro-longed incommunicado detention on lawyer Wang, has seriously infringed human rights, domestic law and international treaties including “Constitution of the People’s Republic of China” (the Chinese Constitution), “Criminal Procedure Law of the People’s Republic of China” (the Criminal Procedure Law), the International Covenant on Civil and Political Rights (ICCPR), etc. We are highly skeptical about the grounds of holding Wang’s trial in secret by the Court. The Chinese Constitution stipulates that all trials should be conducted in accordance with the principle of open trial and thus shall be open to the public, except the cases involve state secrets, protection of minors or matters of privacy. Despite the fact that a court is entitled to conduct a closed trial when cases involve state secrets under the Criminal Procedure Law, the abusive use of the broad and imprecise definition of state secrecy against rights defenders in China has long and often been criticized both in and out of the country, and Wang’s case is no exception. According to “the Johannesburg Principles on National Security, Freedom of Expression and Access to Information” (hereafter “the Johannesburg Principles”), no restriction to the right to open trial should be allowed unless and until evidence is legally sufficient to prove actual harm to a legitimate national security interest, i.e., a country’s existence or its territorial integrity. Even if it is proved necessary to impose restriction on the right to open trial, the restriction shall only be made “to the extent strictly necessary for the purposes of considering evidence that has been classified as a secret.” The prosecutors have not yet offered legally sufficient evidence to justify the necessity of restricting Wang’s right to open trial. Serious concerns should be raised that the closed trial in this case, without a legal ground, violates the principle of right to open trial set out in the Chinese Constitution. The family-appointed lawyers, Cheng Hai and Lin Qilei, have been disallowed to meet Wang. Nonetheless, the authorities unilaterally appointed Liu Weiguo as Wang’s defense lawyer, disregarding Wang’s right to legal assistance of his or his family’s free choosing . Articles 7 and 8 of “Provisions on Legally Protecting Lawyers’ Practicing Rights”, which was revised in 2018, clearly stipulate that a defense lawyer shall have the right to meet a defendant. In case where a defendant intends to dismiss the counsels, the defense lawyers can request to meet the client in person as to confirm the termination. We are obliged to point out that the aforementioned accusations undoubtedly are inconsistent with the international standard of “endangering national security”, which fails to respect Wang’s right to demonstration and freedom of speech. As stated in “the Johannesburg Principles”, the Chinese authorities shall not impose restrictions nor punishment on Wang in the name of “national security” simply due to his exercise of the freedom of expression, amongst others, delivering critical speeches against the government unless and until the evidence is legally sufficient to prove Wang’s behaviors and speeches incited immediate violence for the purpose of subverting state power. Every Chinese citizen is entitled to two fundamental rights – freedom of speech and freedom of assembly according to the Chinese Constitution. Lawyer Wang, who was accused of “subversion of state power” for his participation in human rights activities, had simply exercised the two legitimate rights he should be entitled to. Therefore, the conviction of Wang is obviously unconvincing as it seriously breaches the Chinese Constitution. 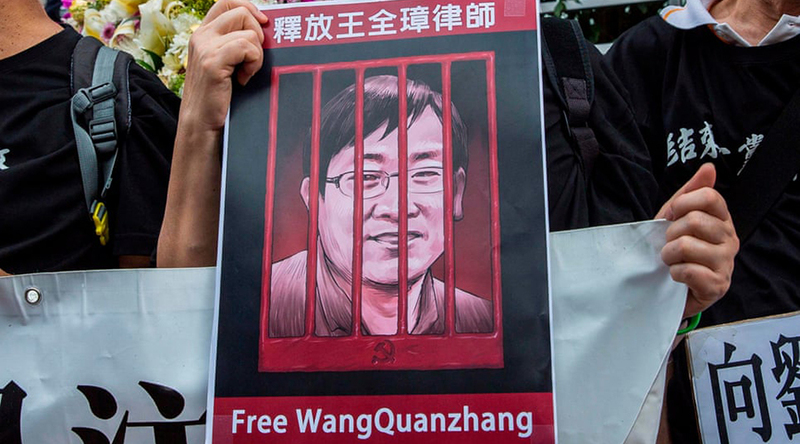 Wang Quanzhang was detained by the Chinese government for more than 1,200 days before the trial. During the entire detention period, the authorities did not provide a proper account of Wang’s prolonged detention to the public, including Wang’s family and family-appointed defense lawyers. As stipulated in the Criminal Procedure Law, despite the right of the court to extend the detention period upon the approval of the Supreme People’s Court, all courts are obliged to protect a defendant’s right to be free from arbitrary detention which is guaranteed by the Chinese Constitution. Serious concerns are raised over the independence and impartiality of the Court for incessant extension of Wang’s obviously unreasonable detention of more than 1200 days. In addition, Wang’s family and family-appointed defense lawyers had no way to authenticate if Wang had suffered torture or inhumane treatment during the whole procedure. We express grave concern over lawyer Wang’s personal safety and health condition. We also note that lawyer Wang was forced to take medication for high blood pressure during the detention despite the fact that lawyer Wang had no previous history of chronic illnesses before his disappearance. Considering that some victims of 709 Crackdown was also force-fed medication which led to poor health condition afterwards, we are worried that lawyer Wang might face similar treatment or suffer torture of various levels. Li Wenzu, the wife of Wang Quanzhang, has been relentlessly and perpetually fighting for her husband’s rights in the past three years. She has protested at the Supreme People’s Court for more than 30 times. The recent head-shaving protest – “We can go bald, but the country cannot be lawless” (我可以无发，你不能无法) – has successfully drawn the international attention. On the one hand, the count has refused to respond to her requests; on the other hand, Li has been placed under constant surveillance and harassment of public security officers. Their child’s right to education was once deprived. It is despicable that the authorities have imposed such restrictions upon human rights lawyers’ family members. Over the past three years, a number of human rights organizations, lawyers’ associations and even foreign governments all over the world have repeatedly released open letters and statements to call on the Chinese authorities to strictly abide by international human rights treaties, the Chinese Constitution and laws as to protect the fundamental rights of lawyer Wang Quanzhang. However, not only has the Chinese authorities shown its arrogance and turned a deaf ear to all demands and appeals, but also ultimately imposed severe punishment on the well-known lawyer Wang Quanzhang. These maneuvers have revealed that “the rule of law” in China is just a veneer to deceive the world, while the Chinese authorities hardly has any intention to conform to international treaties as well as the Chinese Constitution and laws. After all, political power has triumphed over law and human rights in China. 4. Stop any form of suppression against Li Wenzu and their child.